The Winnipeg Santa Claus Parade came to the city last Saturday, celebrating its 109th year. This year a new Santa Claus float was the focus of the parade. The first Santa Claus parade began in 1905, put on by the Eaton’s department store in Toronto. In 1909, Santa Claus parades began in Winnipeg and Montreal. 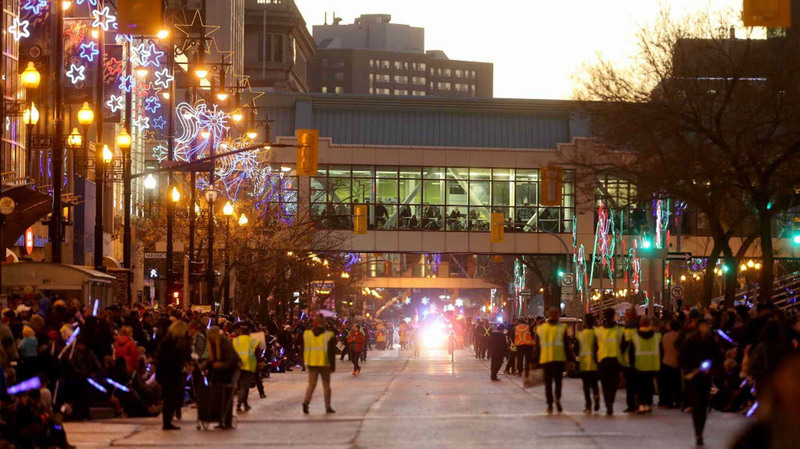 More than 3,000 Manitobans usually take part in the parade itself, making the Winnipeg Santa Claus Parade the second-largest parade in Canada and the largest nighttime parade. This year 77 floats were entered into the parade. Monica Derksen, the Winnipeg Santa Claus Parade director, said the new float was purchased this year because of support from across the city, after the withdrawal of a major sponsor. “This project was made possible because all of Winnipeggers,” she said. This year, the Santa’s sleigh float was declared unsafe because of its deteriorating decorations and its burnt-out lighting. After sponsorship fell through, a GoFundMe page was created with a goal of $100,000 to repair the float. Through the aid of many companies and Winnipeggers, $161,401 was raised, ensuring the continuance of the parade. “We started about a year ago with this project and we had a bit of a slow start and then when we sort of got to a crisis moment, we asked the city and the province to step in and help us out and they did in a big way,” said Derksen. The Santa Claus Parade organization needed $100, 000 for the repairs of the float and some of the raised funds after that were used toward the rest of the parade. The organizers said the additional funds will be put toward the maintenance and storage costs of the float for its first year. Any funds after that will be put into a bursary program for non-profit and community organizations. The parade took place on Nov. 17 this year with block parties, Santa’s workshop filled with crafts, cookies and photos with Santa at Cityplace and a performance by Camerata Nova, singing holiday classics and some of their own songs as well. Derksen said the parade is welcoming for all Winnipeggers. “I think one of the things that we really strongly identify with is it’s free and open to the public,” she said.